The face that launched a thousand tweets. Superhero comics have long relied on final-page cliffhangers: Our hero is … dead? The bomb timer only has … one second left? Could it be that … we’ve traveled back in time? The goal, of course, is to shock readers into buying the next issue, and presumably that’s what comics scribe Nick Spencer and his colleagues at Marvel Comics hoped to do when they executed a final-page revelation in last Wednesday’s Captain America: Steve Rogers No. 1: We learned that Cap is actually … evil? The Star-Spangled Avenger uttered the words, “Hail Hydra,” the fascistic slogan of longtime villain collective Hydra. Say it ain’t so! What Marvel couldn’t have predicted is that those three syllables of dialogue would cause a bizarre, head-spinning chain reaction. The online fallout to the twist has included vicious accusations of anti-Semitism, backlash to those accusations from comics historians, a torrent of death threats, a much-read essay comparing the aforementioned death threats to demands for queer inclusion in comics, essays backlashing that essay, a harsh fight between a prominent comics blogger and a successful comics writer, and Thor knows what else in the future. The superhero-fiction blogo- and Twitterspheres haven’t seen an uproar this loud and complicated in recent memory — and, as crazy as it all is, the incident has led to some legitimate and intelligent debate about how fandom works in 2016. The story actually began nearly a month before the release of the fateful comic. On April 30, writer Alexis Isabel tweeted, “Dear @Disney, #GiveElsaAGirlfriend,” referring to the newly iconic and well-chilled princess from Frozen. The hashtag caught on and became a full-blown campaign for queer representation in the Disney canon. More than a week later, Twitter user @thewntersoIdier inadvertently kicked off an offshoot campaign: #GiveCaptainAmericaABoyfriend. It, too, went viral, in this case among fans of the Marvel mythos. The cries for Cap to be officially gay or bi reached a fever pitch late in the month. On May 22, comics-gossip site Bleeding Cool said it had sources saying something big was coming from Marvel that Wednesday (the day of the week when new comics come out). Two days later, the site’s chief, Rich Johnston, apparently got to see an advance copy of the next day’s debut issue of new series Captain America: Steve Rogers (there are currently two Caps in comics right now; don’t ask, that’s a whole other thing), written by Spencer with art from Jesus Saiz. “[I]t will utterly change the history and very nature of Captain America,” he declared. Fans quixotically hoped that a queer turn might be the anticipated shift in the status quo. It was not to be. 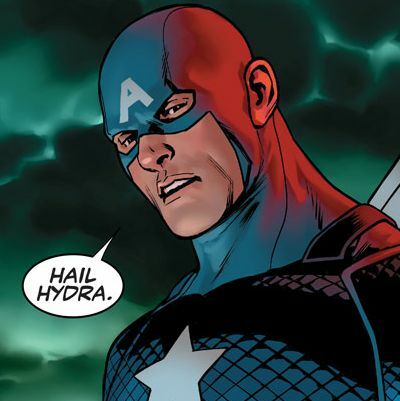 Instead, America awoke to find its Captain act out that Hydra dun-dun-dunnnn moment. Earlier in the comic, the story had made clear that Hydra was affiliated with Nazis and white nationalism and that Steve may have been a sleeper agent all this time. Marvel had a PR blitz prepared and seeded a number of interviews for Spencer and editor Tom Brevoort. “This is not a clone, not an imposter, not mind control, not someone else acting through Steve,” Spencer said in an Entertainment Weekly interview published that day. The expected response, no doubt, was supposed to be surprise, faux outrage, and curiosity about where Spencer — a very talented, up-and-coming writer — was going with this. And sure, some folks had those mild responses, including big-screen Cap depictor Chris Evans. But those voices were swiftly drowned out by fury. A hashtag got going: #SayNoToHYDRACap. It played host to an array of angry responses, some far more reasonable than others. On it, you could find people who objected on creative grounds: “#SayNoToHYDRACap because completely erasing a beloved character’s 75 year legacy for ‘shock value’ is not edgy, it’s just bad writing,” read a popular tweet from actress/artist Lucia Camille. You could find people who said #GiveCaptainAmericaABoyfriend was the kind of thing Marvel should have done, especially because there’s long been a corner of Marvel fandom who imagines him as queer: “#SayNoToHYDRACap because since when is turning a superhero into a Nazi more acceptable than making him an LGBT icon? !” tweeted user @bucc. Meme parodies of the fateful page abounded. But the most eyebrow-raising responses came from onlookers who thought Spencer’s reveal was anti-Semitic. Back in 1941, Captain America — himself a blond-haired Aryan dreamboat — was dreamt up by two Jewish writer/artists, Joe Simon and Jack Kirby. The accusers felt that making him (possibly) a member of a Nazi-affiliated group was a slap in the face for the Jewish community. Tweets along those lines were plentiful. Tumblr and Twitter users urged allies to make donations to the United States Holocaust Museum as a form of protest. Spencer’s defenders pointed out that two Jewish creators, Stan Lee (who likes Spencer’s twist) and Kirby, had done a Cap storyline in 1965 where he seemingly became a Nazi; it didn’t really tamp down the anger. Writer Jessica Plummer wrote a widely shared piece for comics site Panels in which she said Cap was now associated with anti-Jewish genocide: “I am angry because how dare you use eleven million deaths as clickbait,” she said (emphasis hers). However, those people were not the dangerous ones. The ones calling for Marvel employees to be killed were. Most of the death threats were, predictably, lobbed at Spencer. “. @nickspencer die rat die rat die rat die rat die rat die rat die rat die rat die rat die rat die rat,” read one tweet. “die,” read another. “Kill.your.self,” went a since-deleted one. Brevoort, the Marvel editor, got a truly horrifying message sent to his Tumblr from someone claiming to be a Marine. “I WILL find you eventually, and I WILL kill you in the most painful way possible that I can think of,” it read. “The ONLY way to stop me is to have me killed.” It could easily be a troll, but Brevoort said he reported it as a legitimate death threat, which is entirely reasonable. Even pets weren’t safe: When Guardians of the Galaxy director James Gunn declared his support for Spencer on Facebook, a user called for his cat to be thrown into a wood chipper. This fracas is nowhere near over. Comics Twitter is still reeling from a vicious and now-deleted fight between the editor-in-chief of geek site Comics Alliance and the writer of The Amazing Spider-Man, about Faraci and death threats (a decent summary from critic Emma Houxbois can be found here, though it’s an explicit defense of the EIC against the scribe). The Washington Post just entered the fray this morning with a piece by Sonny Bunch headlined, “Artists need to step away from their most obsessed fans.” Do a Twitter search for “faraci” or “#SayNoToHYDRACap” and you’ll see constant updates. The calmer, more eloquent parties in the battle are raising legitimate and vital questions about the relationship between creators, creations, and consumers in the age of online campaigning and ascendant fandom. When creators can so easily see real-time anger thrown in their direction, how can that not influence their art, at least at a subconscious level? And what could the resulting risk aversion cost consumers in the long run? Conversely, how can creators and their allies defend a story without ignoring or dismissing the legitimate political concerns of audiences? And what do you do when death threats enter an argument, either in support of or opposition to your own views?